The National Institute for Education & Research (NIER), recently organized Golden Star Award 2016 at India International Centre, New Delhi, to motivate and reward Country’s Best Professionals and Doctors for their Social Commitments and impact of life to the society. On this mega function, Padmashri Smt. 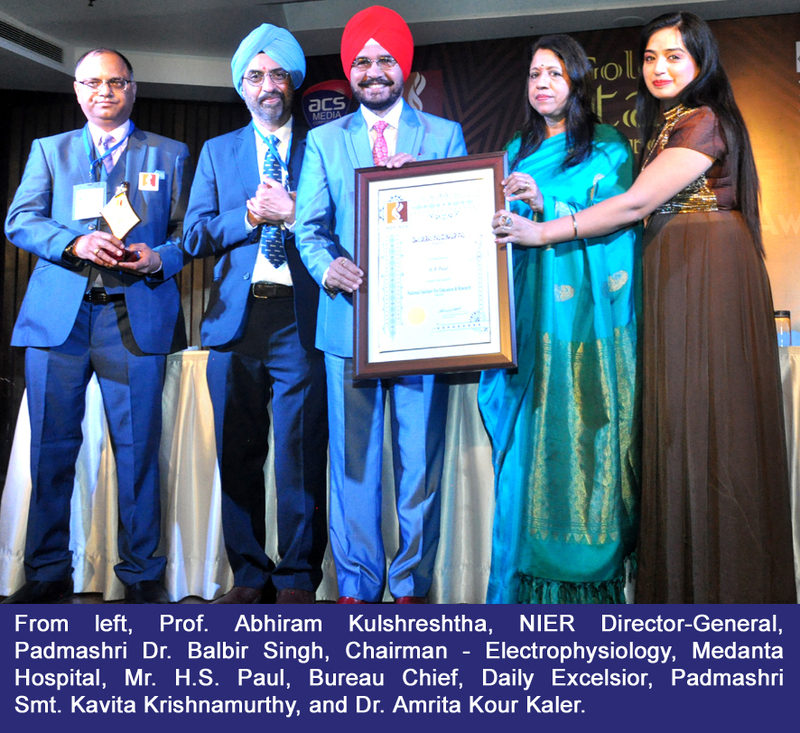 Kavita Krishnamurthy, Legend Playback Singer, Padmashri Dr. Balbir Singh, Chairman – Electrophysiology, Medanta Hospital, and Dr. Amrita Kour Kaler, Former Beauty Queen, given prestigious Gauravacharya Award to Mr. H.S. Paul, Delhi Bureau/Ad Chief of Daily Excelsior, Jammu, for his remarkable contribution in the field of Media/Advertising. Born in Punjab in April 1956, Mr. Paul has experience of 40 years in the field of Journalism, Advertising and Marketing. He worked with various highly reputed publications and since 1989 working with largest circulated English newspaper of J&K – Daily Excelsior. He is a former President of Delhi Advertising Club, Members of Foreign Correspondent Club of South Asia, Advertising Standards Council of India, Mumbai, Public Relations Society of India, and Delhi Management Association. Prof. Abhiram Kulshreshtha, NIER Director-General, thanked the Chief Guest, Padmashri Smt. Kavita Krishnamurthy, Guest of Honour, Padmashri Dr. Balbir Singh, Dr. Amrita Kour Kaler, Dr. Jagannath Patnaik and Dr. Easwaran Iyer, eminent personalities and hundreds of people from different walks of life present during this grand occasion.